Or a completely interleaved compiler could intermix all of these stages, literally generating final code as part of the parsing engine. The text focuses on an organization where the parser creates a syntax tree (and no full parse tree), and semantic analysis is done over a separate traversal of the syntax tree. The Tony Hoare observation about disabling semantic checks being akin to a sailing enthusiast who wears a life jacket when training on dry land, but removes it when going to sea. "In general, compile-time algorithms that predict run-time behavior are known as static analysis." In Ada, ML, and Haskell, type checking is static. (An amusing, related paper: Dynamic Typing in Haskell). Language design is where you make the decisions that drive what can be statically checked. Attributes; these are values associated with terminals and non-terminals. Synthesized attributes are derived from children; inherited attributes come a parent or a sibling; L-attributes ("L" from "Left-to-Right, all in a single pass") come either from a left sibling or from the parent. The process of assigning values to a tree is called annotation or decoration. If all of the attributes in an attribute grammar are synthesized (i.e., derived from children), then the attributed grammar is said to be "S-attributed". All of the rules assign attributes only to the left-hand side (LHS) symbol, and all are based on the set of attribute values of the right-hand side (RHS) symbols. If any of the attributes in an attribute grammar are inherited (i.e., a LHS symbol which has an attribute derived either from the RHS or from a left sibling symbol), then the attributed grammar is said to be "L-attributed". exprtail(A) ::= MINUS CONST(B) exprtail(C). Consider the inherited actions: In the first line, exprtail (a LHS symbol) has its subtotal ("st") attribute set to the value of its left sibling, CONST. In the second line, the LHS exprtail's subtotal is reduced by CONST's value. In the third line, exprtail has its value derived from its subtotal. Practical programming languages generally require some L-attributed flow. As a notation, grammars are declarative and do not imply an ordering; a grammar is well-defined iff the rules determine a unique set for each and every possible parse tree. A grammar is noncircular if no attribute depends on itself. Clearly, a S-attributed grammar can be decorated in the same order as a LR parser, allowing a single pass that interleaves parsing and attribute evaluation. Equally clearly, an L-attributed grammar can be decorated in the same order as LL parser, allowing a single pass that interleaves parsing and attribute evaluation. 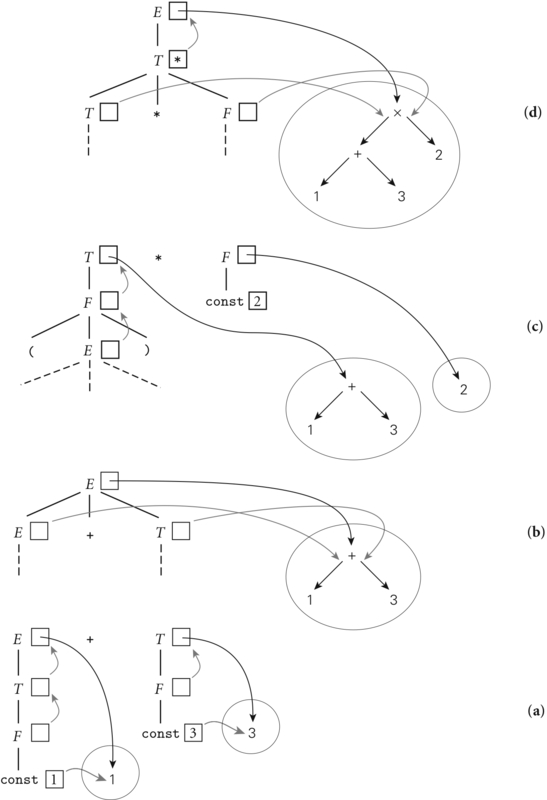 Attribute flow is not just "LR <-> S-attribute"
Page 188: "... it is often possible for a bottom-up parser to accommodate some non-S-attributed attribute flow..."
A parser can use semantic actions to just build a syntax tree, and then use a separate semantic analyzer to decorate the tree. Page 191: "Most production compilers, however, use an ad hoc, handwritten translation scheme, interleaving parsing with at least the initial construction of a syntax tree, and possibly all of semantic analysis and intermediate code generation." In LL parsing, one can embed action routines anywhere on the RHS; if you are writing a recursive descent parser, the action routine at the beginning of a production rule is placed at the beginning of the implementing subroutine, and so on. If you are building a tree, you can use those nodes to hold the attribute information. If you don't build a tree, then for bottom-up parsing with an S-attributed grammar, one can use an attribute stack mirroring the parse stack. As mentioned earlier, the focus in this text is having the parser create a syntax tree and then using a separate stage for semantic analysis and intermediate code generation. 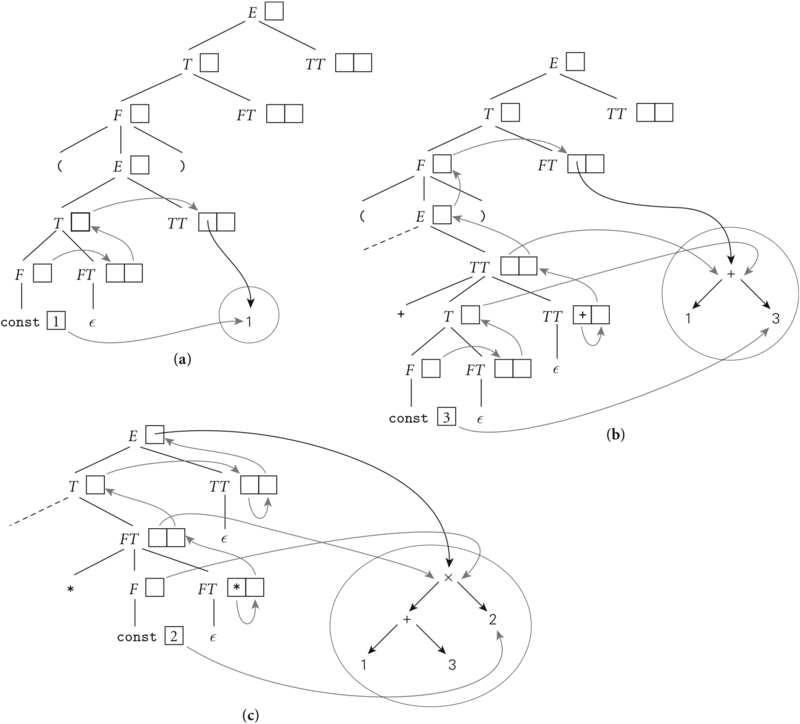 Tree grammars augmented with semantic rules are used to decorate syntax trees, analogous to the way that context-free grammars augmented with semantic rules can create decorated parse trees. Generally, these are implemented with mutually recursive subroutines.